Take part of this MapRoulette Challenge which is about checking if there’s a pedestrian street crossing (crosswalk) or not. This verification goes on until it’s all done. MapRoulette is a kind of gamified website and a mapping campaign similar to MapZen’s targeted editing series. Once integrated in OpenStreetMap (OSM), crosswalks are shown in web maps (e.g. OSM Cycle Map/OSM Radfahrerkarte/OpenCycleMap, OSM France and OSM2World). And they are useful for pedestrian navigation apps (like OsmAnd). So help OpenStreetMap to improve this missing information! Figure 1: Cycle map from OpenStreetMap main page showing pedestrian street crossings (crosswalks) as yellow dot markers. A crosswalk node needs to be placed as part of a way. It requires the tag highway=crossing (search for “Crossing” e.g. in built-in online editor “iD”). 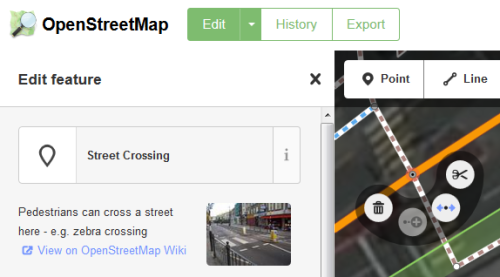 For the capture of other attributes like the existence of islands or traffic signals see Key:crossing on OSM Wiki. Important notes: When using editor “iD” the presets suggest tag crossing=zebra. This tag is mainly used in UK. Since this challenge is in Switzerland you can delete this tag. Finally: When saving, a changeset comment is needed. You can use there e.g. “Missing Crosswalks Challenge”. Figure 2: A “Street Crossing” node shown in the online editor “iD” built-in OpenStreetMap main page. The street crossings (crosswalks) in fact are coordinates our automated process found in aerial images by using a parallel image detection algorithm. This new software works mainly with yellow crossings of Switzerland on aerial images with certain quality at zoom level 18. The coordinate data around eastern Switzerland has been extracted at December, 2nd. 2015. This covers about a tenth of the total area of Switzerland. Contact us if you have questions or ideas around this hot topic. This article was originally published on geometalab. This entry was posted in Announcements by sosmAdmin. Bookmark the permalink.